Switch so far is utterly disappointing for me: 1. Only one first party game I liked: Super Mario Odyssey, rest are either Wii U ports including Breath of the Wild or same old formula game like Kirby Star Allies, 2. No virtual console, 3. Nothing to look forward to this year since I’m not into fighting games. I feel this system doesn’t deserve the credit it is getting. Most of the first party titles are just ports. I mostly agree, but I do get the appeal. Lot’s of people didn’t have Wii U’s so a lot of the ports are as good as new games to them. I’m not into portability, but lots are and buy the indies and ports there instead of on PC or another console like I do. And so on. It’s a great system for portable gamers, people who didn’t have a Wii U and people who like more Nintendo games and indies than I do. For me it’s just something to play a few Nintendo games a year on, occasional matches of Splatoon etc. while PS4 and PC get most of my gaming time and dollars. Name of game leaked by Nintendo. Since the Direct was originally scheduled for today, they revealed the name on their website. Probably had it automatically set to update with the info and forgot about it. Interesting. Loved Woolly World. Shame they bumped this to 2019 though, but not as bad as them delaying the US release of that game for months over the EU release. I still say it looks highly derivative of Little Big Planet (even the music sounds similar). But I'm at least confident the mechanics will be better in Yoshi. Releases March 29th; file size is just over 5Gb. I'll definitely pick this up after Super Mario Bros. U Deluxe. I have this pre-ordered now on Amazon. 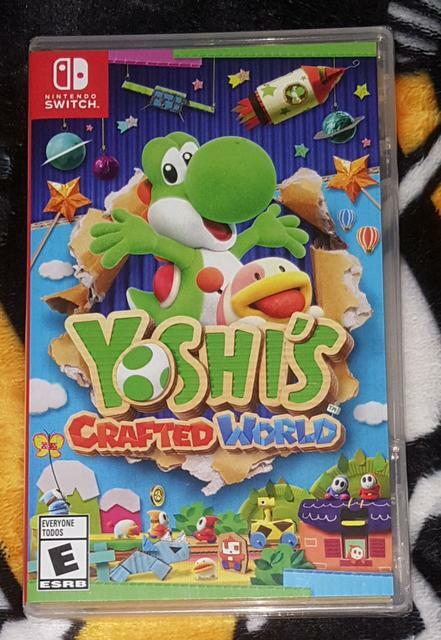 So excited... always loved Yoshi games, so I was hoping for one on the Switch. I cant believe Nintendo charging 60.00 for this game. No Yoshi game will ever surpass the Super NES classic Yoshi’s Island. 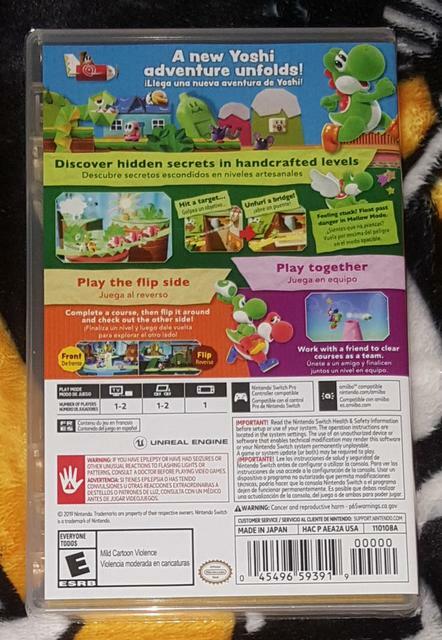 Same price as Kirby Star Allies which this feels pretty similar to (spring release 2.5D platformer from a second tier Nintendo franchise). The one Switch price which really jumped out to me was Donkey Kong Country Tropical Freeeze as similar type of game, and were charging $60 for a version of game which launched for $50 over four years prior and with minimal additions other than an easy mode (which, to be fair, should have always been there or at least added in update in the Wii U version). Yeah I complained about Kirby as well. Let's be honest, this is not a AAA game. Yoshi, along with Kirby are glorified 3DS games, just played at a higher res. Theres no way Nintendo sank a lot of money in developing this. Imo this is a 39.99 game at best. If Sony could release a game like Ratchet and Clank at 39.99, which is eons more ambitious than Yoshi, then Nintendo has no business selling this for 60.00. I impulse bought this the other day to have sowmrning new to play on an unplanned trip (death in my wife’s family). I’m enjoying it more than I expected too. It’s a nice, charming and relaxing game. There’s quite a bit to do if you try to 100% each level with the collectibles and flip side stuff. Location: Moving to Utah soon! Fun game. My 6 year old loves it and I enjoy it too. No complaints about the price as Nintendo games are worth it. This has been a great game. I was lucky enough to have it delivered the day before release date so I got an early start on it. I’ve been 100% completing all stages except for the Go-Go Yoshi level. As hard as I try, I can’t get all the flowers. It’s a bit upsetting. Has anyone here gotten all flowers on that level? this is so fun and is really like if you had yoshi's island and combined it with kirbys epic yarn.